At least two of the officers also maintained sexual or intimate relationships with their targets or informers. This was the subject of several meetings of Hamburg’s internal-affairs authorities and of internal police enquiries. For seven years, under the responsibility of the Hamburg Criminal Police Office, undercover investigator Iris P. infiltrated leftist structures. According to a research group which published details in early November 2014 she was active from 2000 to 2006 under the alias of ‘Iris Schneider’. Her exposure resulted from a chance discovery. Following her withdrawal from duty as an undercover investigator, P. worked on the Smart Approach prevention project in the Islamist Extremism Prevention Division of the Directorate-General for State Security in the Hamburg Criminal Police Office. She was recognised at a public event held by the authority. Activists had already become suspicious and had launched enquiries back in 2002 but had dropped them, partly in response to criticism from other groups. As the Hamburg Senate explained shortly after her exposure, P. had initially been deployed as a plain-clothes policewoman as part of a preventive measure and then in an operation conducted for the Federal Public Prosecution Office. The Hamburg Police themselves had ordered the undercover investigations under section 12(2) of the Hamburg Data Protection (Police) Act on grounds of imminent danger. The investigations on behalf of the Federal Public Prosecution Office were conducted by the Federal Criminal Police Office from 2002 to 2004, when the case was taken over by the Land Criminal Police Office for Schleswig-Holstein. P., however, continued to work for the Hamburg Criminal Police Office until 2006, not operating now as an undercover investigator but as a ‘situation assessment observer’. In this role she no longer had the power to enter residential premises. To gain such access, she evidently used her status as an undercover investigator for the Federal Public Prosecution Office. The information she gathered also reached the Land Office for the Protection of the Constitution in Hamburg, which, as the internal intelligence service, is responsible for detecting supposed extremist threats. The Hamburg Department of the Interior found 68 case reports from P. which the Land Criminal Police Office had forwarded to the Land Office for the Protection of the Constitution in the framework of their cooperation. In these reports, personal data were gathered on the persons under surveillance in breach of the applicable legal provisions. Commenting on this finding, the Data Protection Commissioner for Hamburg, Johannes Caspar, stated that the constitutional precept of separation of the police and intelligence services had been inadmissibly relaxed and that the legality of the operations was therefore seriously compromised. Among other things, P. was active in the Rote Flora left-wing cultural centre and contributed to a leftist magazine as well as to the free radio station Freies Sender Kombinat, which is well known throughout Germany. The competent Department of the Interior had initially given its express approval. According to the Senate, working for organisations in the realm of journalism was fine, as long as its sole purpose was to maintain an alias. In July 2016, however, the Hamburg Criminal Police Office admitted to the Hamburg Administrative Court that the assignment at the radio station was unlawful. The station had brought an action for infringement of freedom of the press and broadcasting. The research group has also pointed out that, during the period of P.’s assignment, the broadcaster’s premises were the scene of a spectacular search raid. In the published material it is said that Iris P. also had intimate and sexual relationships with individuals in the leftist scene. Whether her partners were targets or informers remains unclear in the absence of relevant information from the Senate Department of the Interior. Disciplinary proceedings were initiated against P., who invoked her right to remain silent. The proceedings, however, have now been dropped with the expiry of the statute of limitations. Nevertheless, according to media reports, penalties have been imposed on some of her superiors for infringing their duty of counselling and care by approving P.’s sexual relationships. After the matter had been discussed several times by the Internal Affairs Committee, the Hamburg Senator for Internal Affairs promised ‘reforms’. The police, he said, had been instructed to implement 17 recommendations made by the internal audit unit of the Department of the Interior. These included a system of monitoring in which a wider circle of participants would receive anonymised reports on and discuss all missions of undercover investigators. Back in 1989, the Senate enacted practical guidelines for the assignment of undercover investigators. These guidelines provided for the establishment of a commission whose task was to examine any assignment of undercover investigation officers that had gone awry. If there were no such cases to examine, the commission was to meet at least once a year. An internal audit conducted by the police following the Iris P. scandal, however, revealed that the commission was “presumed to have held its last meeting in 1992, at which it decided to meet henceforth on an ad hoc basis only”. According to the internal audit unit, there was ‘no evidence’ as to whether such a meeting had subsequently taken place. In August 2015 a Hamburg research group exposed another former undercover investigator from the Hamburg Criminal Police Office. In its documentation, which it described as the product of months of research, the team stated that officer Maria B. had been active in the Hamburg leftist scene from 2009 to 2012, operating under the cover name of ‘Maria Block’. According to the team, her main focus was on anti-racist groups, but she also investigated anti-fascist groups, urban struggles and the mobilisation of demonstrators against the Conference of German Interior Ministers held in Hamburg. These findings were confirmed by the Senate. According to the Senate, B.’s mission began in June 2008. For four years she was assigned to ‘risk-prevention’ duties in the leftist scene by the Hamburg Criminal Police Office, although during that time she spent a month as a ‘situation assessment observer’. The research group concluded from this information that the Public Prosecution Office would have had to approve at least three assignments. In the context of the researched operations, B. came across as ‘radical to verbally militant’ and a ‘risk-taker’. Moreover, on her own initiative she established contacts with left-wing structures in other cities. The research group’s report also refers to B. also having maintained sexual contacts as part of her mission. ‘Maria Block’ made several trips abroad. According to the research group, these comprised visits to border camps on the Greek island of Lesbos and to Brussels. She also reportedly infiltrated activities connected with the climate summit in Copenhagen. B. is also said to have taken part in a banned demonstration, breaking through police barriers and police cordons, during the protests against the NATO summit in Strasbourg in 2009. According to the Federal Ministry of the Interior, her foreign assignments were arranged through the Federal Criminal Police Office. Michael Neumann, Senator for Internal Affairs, told the Internal Affairs Committee of the Hamburg City Assembly that the presence of the undercover investigator had been requested by foreign authorities. The research group stated that the unmasking of B. was ‘due to a chance discovery’. They were, however, helped in outing her by searching the archives of the Berliner Morgenpost daily newspaper and of the Polizeispiegel, the magazine of the German Police Union, which featured officer B. on its cover photo in September 2003, shortly after her transfer to Hamburg and before her career as an undercover investigator. In May 2016, finally, a research group in Hamburg unmasked undercover investigator Astrid O. Under the alias ‚Astrid Schütt‘, she first appeared on the leftist scene in 2006, and her assignment ended in 2013. O. was active in municipal political groups and the anti-fascist scene. In 2007, she took part in the counter-activities at the time of the G8 summit in Heiligendamm and of the Asia-Europe Meeting (ASEM) of foreign ministers in Hamburg. Then came the preparations to take over a building as a squat and regular participation in the plenary meetings of the occupied Rote Flora theatre building and the Autonomous General Assembly. In 2009, she was one of the founders of the Nella Faccia anti-fascism and anti-repression group. Between these activities, she also began to associate with the ultras who followed Sankt Pauli football club. Her other operations included the preparation and follow-up of the Autonomous Congress in Cologne in 2011 and the counter-demonstrations on the occasion of the neo-Nazi parade on the ‘Day of Germany’s Future’ in June 2012. In the same year, O. was included in a back-up team for the left-wing Fusion festival, where she worked several 12- to 14-hour shifts. The research group also pointed out that O. often “dispensed” affections. Presumably O. was likewise used in a double role as a ‘situation assessment observer’ and an ‘undercover criminal investigator’, partly because this gave her authorised entry to private dwellings. She is believed to have taken over Iris P.’s undercover investigation duties. She operated at the same time as Maria B. and sometimes in the same groups. O. was also sent abroad, the research group asserting that she was accommodated in the same housing project as B. for the 2009 climate summit in Copenhagen. The research group believe that this is a tactic employed by the police, who can withdraw an investigator if necessary without worrying about a loss of intelligence. In contrast to the undercover investigators who had previously been exposed, in the case of Astrid O. the police incorporated many features of the policewoman’s ‘real life’ into her false identity. At the start of her mission, O. had her hair dreadlocked in an Afro shop. Nevertheless, by 2007 some activists were already harbouring suspicions that she had been planted, because she was noticeably curious and authoritarian and by far the oldest member of the group. Activists wondered about a truncheon in her flat and her knowledge of martial arts. As mitigating evidence, O. showed them her personal ID card and bank statements at that time. In April 2013, the policewoman withdrew from the targeted political structures, and in October 2013 she resumed her duties at police headquarters. In 2010, British undercover investigator Mark Kennedy was unmasked. He had likewise used sexual relations to gather intelligence and had maintained several relationships, in some cases over a number years. Kennedy was also deployed in Germany. In response to his case, the 16 federal states, along with the Federal Criminal Police Office, compiled instructions for foreign undercover investigators. These instructions lay down obligations to notify and report to the host police authority as well as prohibiting the use of sexual relations with targets and informers. However, the exact contents of the instructions are unknown since the document has been categorised as classified information. 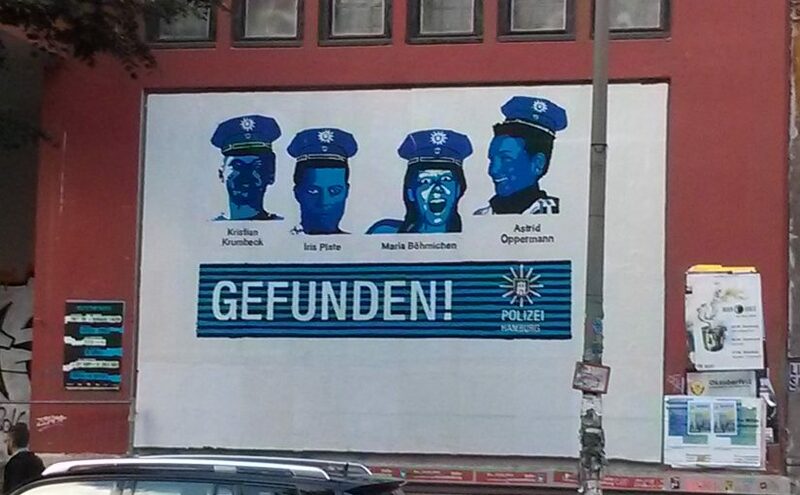 Image: Indymedia (Collage) After Hamburg police censored a huge poster showing faces and names of disclosed undercover officers at autonomous centre Flora, I changed this article image (found it on Indymedia as well). The old one can be seen here.